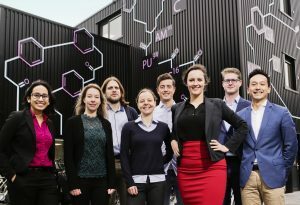 Dijkshoorn set up her own company EV Biotech this summer, together with two co-founders. EV Biotech has developed a new production platform to produce high-quality molecules. The young entrepreneurs use computer models and micro-organisms for this purpose. The principle of synthesis is deceptively simple. Take soft drinks. Soft drinks usually get their colour and flavour from molecules made through chemical synthesis. Suppose you want to add a grapefruit flavour to the soft drink in a sustainable and natural way. A green, sustainable and organic method which offers great market potential. Bacteria synthesis is at the source of making beer, bread or wine. But it is now also used for making sustainable plastics, specific proteins and pharmaceutically active molecules or for developing sugar substitutes. Besides the physical lab environment where the bacteria are cultivated, EV Biotech offers a digital laboratory in which all gene combinations of micro-organisms can be tested. The digital platform can predict in advance the best gene combinations as well as which combinations won’t work. This predictive value means less experimental work in the laboratory – resulting in less waste, lower costs and a lower CO2 footprint. Entrepreneurship was already rooted in Linda Dijkshoorn at an early age. While studying molecular cell biology at the Vrije Universiteit Amsterdam, she set up a homework guidance institute which enabled her to fund her Master’s degree. She then went on to do her PhD trajectory in synthetic biology. Here she was able to develop her skills that were the first step towards EV Biotech. She received support from VentureLab North, the incubator for entrepreneurship in the Northern Netherlands headed by Prof. Aard Groen from the University of Groningen. VentureLab North offers a breeding ground for new knowledge and contacts, and initiates potential collaborations between students, the business sector and the government. ‘The team at VentureLab North can help you with everything in and around a company. I’ve especially benefited from the network. If you have specific questions, they’ll look for specific knowledge for you. VentureLab North forms the basis of where I’m standing as a CEO today,’ says Linda paying tribute to Aard Groen and his team.